I will go ahead and say it -- I absolutely LOVE Saboten! 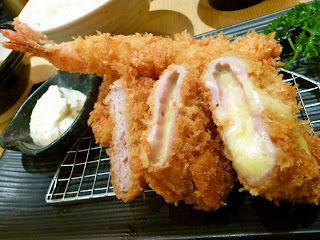 Saboten is one of my favorite restaurants for Japanese pork tonkatsu. The tenderloin katsu, the crispy breading, the tonkatsu sauce, and even the cabbage sesame dressing are to die for. I had serious craving for tonkatsu so I convinced my husband to have dinner at Saboten this evening. Saboten is located at the top floor of Parco Department Store in Millenia Walk. 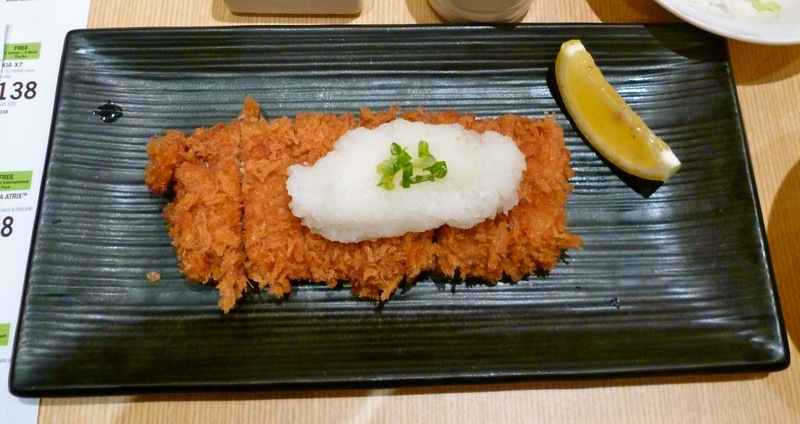 We normally order their Tenderloin Katsu Set, but today we tried out some of their specials. They have a limited edition Cheese Katsu selection available for the months of September to October, so I chose the Cheese Tenderloin Katsu Supreme (SGD 23.00). This had the cheese tenderloin katsu, regular tenderloin, and ebi/ prawn. I really liked this assortment. The melted gooey cheese added a little twist to the katsu. And because there were other types of meat in the dish, the cheese did not get tiring at all. 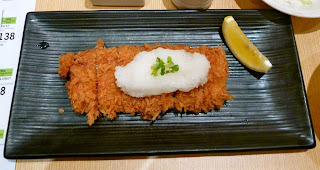 My husband got the Grated Radish Tenderloin Katsu (SGD 24.00). This is served with a vinegar sauce on the side which you pour on both the radish and the pork. This was very delicious as well, and my husband thoroughly enjoyed it. The vinegar and radish were the perfect balance of tanginess for the pork. All the katsu dishes come with free flowing cabbage, rice, and miso soup. There is also one serving of green tea ice cream served at the end of the meal. This was another satisfying visit to Saboten. I highly recommend this place for tonkatsu and pork lovers like me! Feel free to try anything from their different katsu varieties, but I suggest you stick to those that make use of the tenderloin pork. The meat is just extra juicy versus the regular loin. The Cheese Tenderloin Katsu Supreme looks superb! Is it still available even though it's February now? Hi Charlotte, thanks for stopping by. Yes, the cheese tenderloin katsu was divine! They have seasonal specials -- last I checked they were running the Oysters Specials until end-Jan. You can try calling them to find out what promo they have running this Feb :) Their number is 6333 3432. Happy dining!